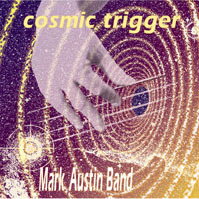 cosmic trigger the debut release by the Mark Austin Band combines thought provoking vocals. mind altering guitar, and mantra like bass lines; harmonizing to the tune of transcendent horns, a clairvoyant drum beat, and astral percussion. With the band’s flavorful arrangements becoming the canvas onto which Austin surrealistically paints his lyrics, the Mark Austin Band beckons the imagination to explore new boundaries. Austin’s work melds the influences of Jaco Pastorious, early Chicago and Steely Dan into a modern day pop fusion of acid jazz similar to genre pioneer Liquid Soul, the live jam sessions of the Dave Matthews Band and the solo work of Sting and Phil Collins also come to mind when listening to the Mark Austin Band. The Mark Austin Band has found its formula for success; when people hear their music they can’t keep still, it’s that simple. So put your soul’s finger on the cosmic trigger and give it a squeeze. Instantly you will be shot into a dimension of musical emotion where you feel the tranquil peace of rhythmic harmony. Follow the horns through the ethereal plains searching for the source of the beat, which is the rhythm of life. Get lost in the guitar as you feel the aura of the bass. Roam the melody lines, somersault over the chords, and swim in the sound waves; because after all, it is all about having fun.